City officials and UrbanPromise Academy rededicate a black cemetery where forgotten Civil War soldiers and sailors are buried in Camden. 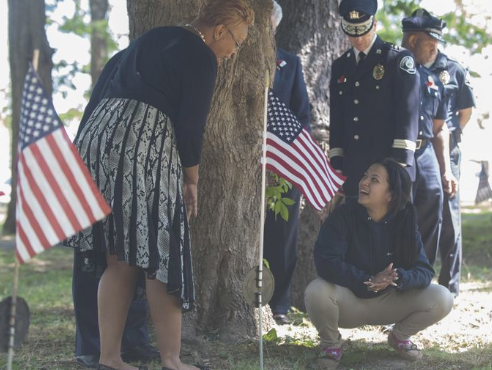 CAMDEN – A procession of UrbanPromise Academy students, local dignitaries, veterans, history buffs and others respectfully filed past rows of several dozen weathered gravestones of veterans to the beat of a single drum. Some in the line stopped to lay poppies — a Memorial Day symbol — on the flat stones and to read what was legible. A few leaned down and wiped some of the markers with one hand in hopes of brushing away any remaining dust so they could decipher more of the engraved names, military connections and dates of birth or death of soldiers like Charles H. Brown of the 41st Regiment of Philadelphia and sailor Milton Dix, a USS Princeton crew member who died in 1894. 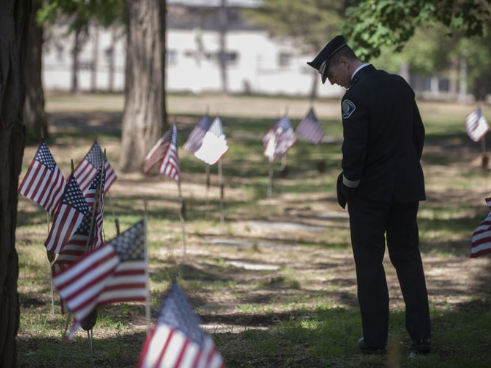 The procession Friday to pay respects was a solemn ending to a ceremony marking the resurrection and rededication of a long-forgotten burial ground at Federal and 38th streets. Established in 1854, the cemetery has an estimated 250 to 300 graves, including 123 for African-American Civil War veterans and other early blacks who settled in Camden. The graveyard is being renamed Johnson Cemetery Memorial Park, although the new sign was not delivered in time for the Memorial Day weekend event to commemorate soldiers known as U.S. Colored Troops. 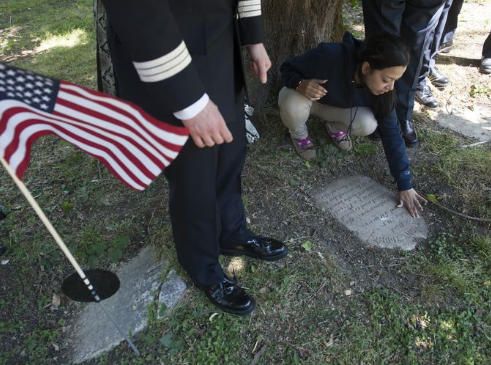 City Council recently designated UrbanPromise Academy caretakers of the long-neglected and overgrown city-owned cemetery. It had become a "needle park," a haven for drug users and trash dumpers, until the high school students took a serious interest in it nearly three years ago and began cleaning it up. Their got involved after learning Civil War history and watching a video about the graves by filmmaker Kevin Walker, a lawyer and history buff who works for the state Public Defender's Office. 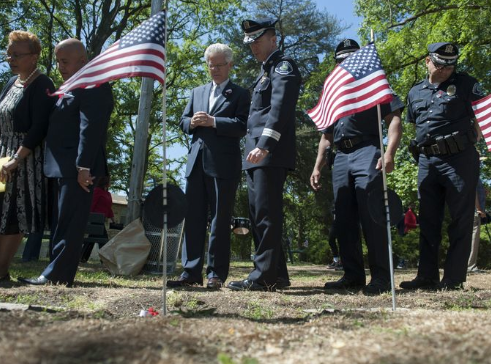 "This is one of Camden's cultural gems and it must be preserved ... and the sacrifice of the veterans and others who lay in rest must never be forgotten," said Mayor Dana Redd, who was joined by Camden County Police Chief Scott Thomson, Fire Chief Michael Harper and Council President Frank Moran. "Youth like these children area helping to transform Camden and restore honor to the cemetery, and we are thankful," Redd said. "I am a strong believer in partnerships." Ashley Gascot, a high school senior involved in the project, said after watching Walker's documentary, "The Lonely Bones," students decided to make the graveyard a school service project. "How could we abandon Civil War veterans who served us? We are thankful to be giving back to veterans who gave us our freedom, and it's great to know this is just down the street from UrbanPromise," Gascot told a gathering of nearly 100. The stones are not on the actual graves. Between 1975 and 1980, local officials moved headstones without disinterring the remains, in order to create a park with a ball field. The graves still lie under the grassy field. Some upright stones were moved to the opposite side of the cemetery under trees and buried flat. Others were removed from the site altogether and taken to another location for disposal, possibly deposited in the Delaware River. UrbanPromise Executive Director Jodina Hicks said the young people have led the way and generated donations of money or services for the project from Wegmans, philanthropist Jane Murphy and a local church. Walker was thrilled that a custodial group is now involved, because he had suggested that approach due to limited city resources. When he did his film research, he sought out local historians and history enthusiast Samuel Asbell, a former Camden County prosecutor who had mapped 25 relocated stones and wrote a book, "The Lost Black Legion." Since the students began a major cleanup, there are now 73 rediscovered stones. Many stones may never be found; some were broken in the move or by children playing years ago. 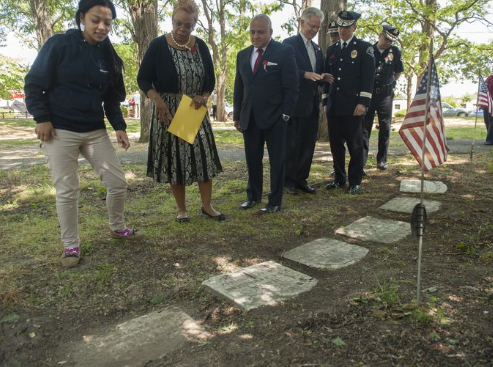 Among the buried veterans area William Miles Butts of Company B, 37th Regiment, who became the first black city policeman, and Peter Postels, the first black Camden County freeholder, as well as the first black city firemen. While those troops likely all lived in South Jersey, Asbell said, they had to join regiments like the 41st out of Philadelphia because New Jersey did not have any black units. "This is long overdue," said Delbert J. Nelson of Camden, senior vice commander of VFW Post 8003 in Lawnside, which absorbed the city's VFW, "and I am so glad to see it happen in my lifetime." 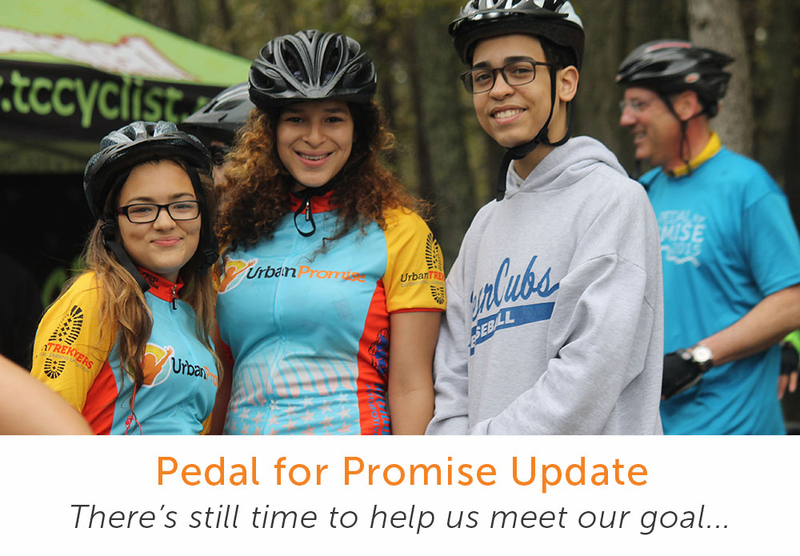 Because of Pedal for Promise, UrbanPromise is able to provide innovative, experiential education to Camden’s teens. With over 520 riders participating this year in the Pedal for Promise, we exceeded our goal of 500 riders — but that was only half of the goal. We still need help to reach our fundraising goal of $150,000 dollars. With $111,225 already raised we need your help to close the gap! 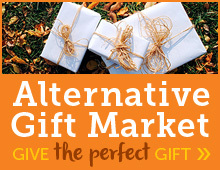 Those dollars will make a difference in the life of a teen who is growing up in a city rife with difficulties. The good news is that with support, these challenges can be overcome: 100% of our young people graduate from high school and 93% go on to college. Our high school students will develop math and science skills through wooden boatbuilding and robotics. They will learn about history and government as they explore the nation's capital and Civil War battlegrounds. Ecology and geography will come alive as our youth travel 2,500 miles through Colorado and Utah this summer and visit 5 national parks. Brandon is one of those young people. There was a time when Brandon couldn’t get off the couch or put his video games away, and going outside to play wasn’t an option for a kid living in Camden. That all changed when he came to UrbanPromise Academy as a freshman and joined the UrbanTrekkers program. He is now a junior, and his dad tells me he’s never home. 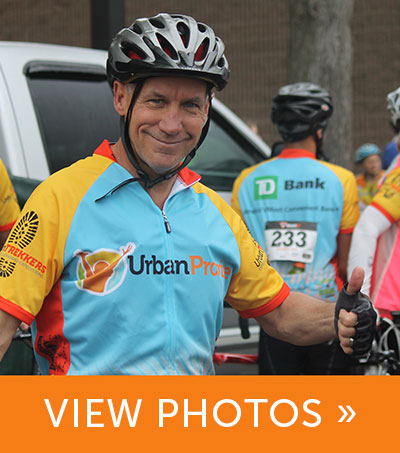 You won’t find Brandon just hanging out on the streets, although you may find him riding his road bike with the UrbanPromise Academy Elite Team cycling through the city and Cooper River Park. If he’s not on his bike, you might find him in the boat shop crafting a wooden canoe as part of the Advance Build or paddling down the Cooper River leading an ecology paddle for other youth. Brandon rode the 62-mile metric route this year, but he cramped at mile 50 and couldn’t finish. When I saw him he was feeling really down, “I didn’t finish Mr. C; I couldn’t make it.” He said he rode 50 miles but it was tough going, “I gave it everything I had.” I told him he was amazing: 50 miles was a big deal! He could ride his bike to Camden and almost back to the New Jersey Pines in that distance. He looked at me in total shock, “It’s really that far?” He now believed he accomplished something terrific. We cannot do this work without you! Whether riding with us on the road or through your donations, your support offers Brandon and all the kids at UrbanPromise the opportunity to get out of the house and experience challenges they never imagined and that will transform their vision of the future that is possible for them. For those who have already contributed to this event: THANK YOU! 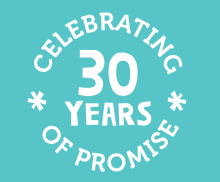 Did you know you can still support Pedal for Promise?! Making a donation today, gives students like Brandon life changing opportunites. I hope Brandon's story inspires you to donate.